In preparation for shoveling out of what will most likely be the Mama of all Snowstorms, I bought SNOWPANTS! 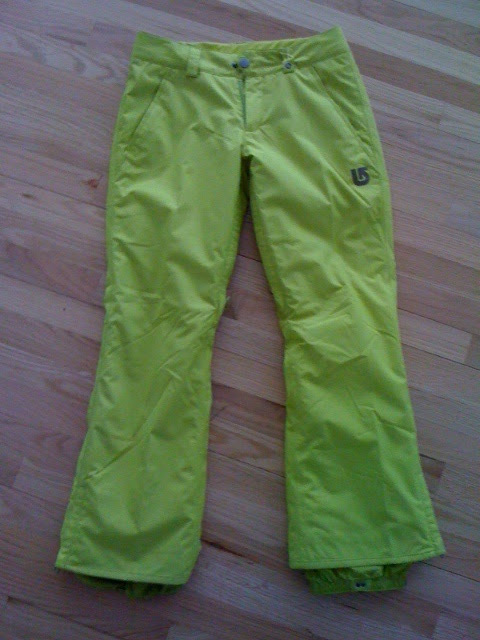 Now, to give a brief history, I've tried to find great snowpants for the past five years. I've attempted the boys route at Target (where I get my boys most everything) and no good. Not a good fit. Not a good look. Not even in the heart of darkness, the grayest, snowiest and coldest Chicago's got to give - nope. As cold as I was, I had to just say no. I've actively, and passively searched for years. It's been lonesome. AND THEN! TODAY! In a mad search for gloves (Target had none) - I ended up at the Shred Shop in Skokie - a skateboarders/snowbaorders mecca! Now, why is it, that snowpants for adults can't be this cool everywhere? Isn't there a huge "cool adult snowpants market" just waiting for exploitation? Why are they reserved for a specialty niche? I love that form follows function - that cool snowpants come from (literally) a cool sport, but why can't this be the norm? Why isn't walking around in groovy "winter pants" just what we do here in a cold but groovy city? Are you with me? Why aren't fantastic snowpants (or shall I dub them "very cool pants"?) readily available for people over 12? Well, at 30% off, today was my lucky pre-megastorm, cold, gray, menacing day. Well designed, very cool pants, SNOWPANTS are now mine. Let the winter games begin... and by games I mean, shoveling.